This phrase, posted under the Citi Bike logo on the Redistribution vans which shuttle bikes from station to station, has often made me stop and wonder, who exactly is that? As I looked for an answer, I stumbled upon mini-revelation after mini-revelation, and as I write this post I hold a new appreciation for the business model design behind Citi Bike. My curiosity regarding the proprietorship of Citi Bike stems from my personal experience with the service. Anyone who has crossed paths with me over the past three months knows that I am obsessed with my Citi Bike membership. With 23 bikes docked at the end of my block, I have used my $149 annual membership for a variety of reasons: quick pedals down to the L train, half hour commutes to and from work in Midtown, gentle Sunday rides through Williamsburg and Greenpoint, and even for 45 minute cardio workouts. My online stats show I have taken 73 trips averaging 12 minutes, traveling over 100 miles. I love Citi Bike. So with a personal interest in bike sharing generally, and Citi Bike specifically, I started researching, and after a morning’s worth of Googling it turns out NYC Bike Share LLC is a small subsidiary of The Related Companies, the massive Real Estate firm founded and majority owned by Stephen M. Ross, the billionaire mogul who owns the Miami Dolphins. The organizational structure which led me to uncover this connection, however, is rather complex. What does this complicated organizational structure look like? We are a leader in designing, deploying, and managing bicycle share systems around the world. We provide solutions for all aspects of bike share, from location assessment and business modeling to system maintenance and expansion. Motivate’s comprehensive approach to planning and operating a bike share system is proven in the systems we currently manage and are expanding. How cool is that?! A single company operates all of the biggest bike sharing systems across the country, despite disparate branding, pricing and scale. This discovery failed to quell my curiosity, but instead drove me to dig further, spying a golden investment opportunity in what amounts to an effective monopoly on bike sharing systems in the US, with an increasing international presence. What kind of a company is Motivate? Is it a startup that could soon IPO? Is it a subsidiary of an existing public transport company into which I could invest? The answer eluded me on Motivate’s website, so I returned to Google. It took me a reasonable amount of searching (read: it wasn’t immediately obvious) to find this WSJ article (paywall), and subsequently this Observer article about a newly formed venture firm, REQX Ventures, ran by a man named Jonathan Schulhof. 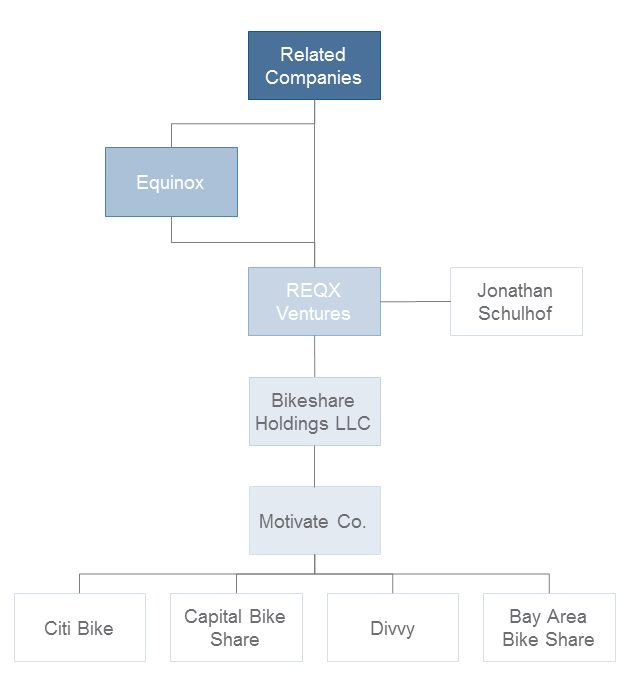 As it happens, REQX Ventures bought Motivate, or rather it’s predecessor – Alta Bicycle Share (hence the difficulty in searching) in October 2014. 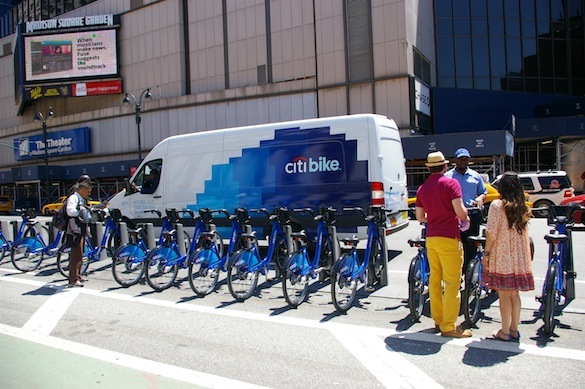 Both articles (understandably) focused their attention on the fact that Citi Bike was receiving an infusion of cash and a change of management to broaden its reach and improve its quality of service. Little was made about the implications of the ultimate ownership. Note: I did not include all of the bike share systems operated by Motivate. This is where the story gets “juicy”. While The Related Companies is clearly not trying to deceive anyone into thinking it has no connection to Motivate (I worked out the link, and I’m no Sherlock), it is fair to say that the Real Estate behemoth is actively not promoting its ownership stake. Why? The answer (I believe) can be found by looking at Related’s core business and finding the connection that makes bike-sharing complementary to its existing model. The Related Companies is in the business of developing and selling or leasing landmark properties. It’s portfolio comprises residential, commercial and retail developments on a massive scale; with Hudson Yards, the Company is developing an entire neighborhood. With such a wealth of properties, Related needs to attract a lot of wealthy people as customers. Today, this means more than just a door man and a well appointed apartment. 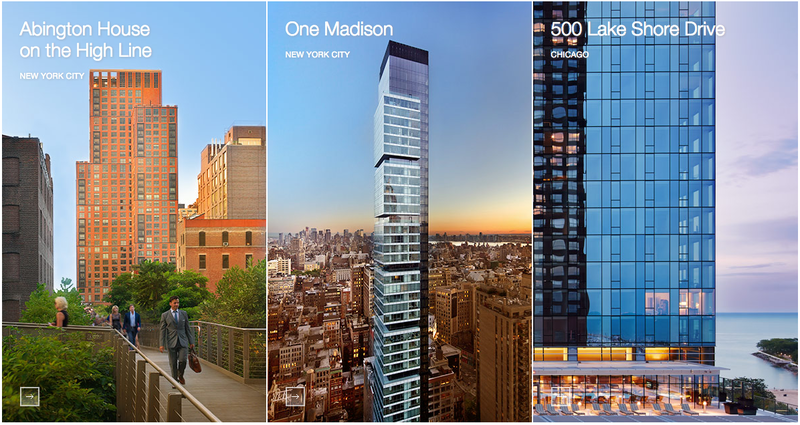 Building amenities are a necessity; roof decks and gyms a must-have for any luxury building. Why do you think The Related Companies has a stake in Union Square Events and bought Equinox, the ultra-luxury chain of gyms that also owns Soul Cycle (the outrageously bouji spinning class)? Citi Bike provides another arrow in Stephen Ross’ quiver to target customers. This may surprise people, but the data backs it up: The Poor Bike, The Rich Bike Share. For young, wealthy urbanites, bike share systems offer a compelling combination of convenience and flexibility, an affordable luxury for pleasant experiences on sunny days, an opportunity to manifest ideologies about quality of life and the environment into action. Given bike sharing’s attraction to its key target demographic, Related’s ownership of Motivate is complimentary to its core business model. The strategy is not to make money off these systems (which is near impossible given the municipal oversight of bike share systems nationwide), but to leverage the system as a value-add to existing properties, and to help ensure the success of new properties on the frontier of markets not traditionally associated with Yuppies, laying the foundation for future opportunities. Related Companies is executing this strategy remarkably well: upon purchasing Motivate the company announced the service’s Brooklyn expansion. At the same time buying numerous properties in the area (link here, here and here). We can also expect Citi Bike to be extremely well integrated in Hudson Yards, with Motivate CEO Jay Walder commenting “Maybe it could be inside of businesses. Maybe it could be inside of buildings. Maybe it could be built into the environment.” Well done, Mr. Ross. I don’t want this post to offer an opinion on whether or not this ownership is a positive or negative; many people will scream “gentrification!” at the idea of pushing a system popular with young, wealthy millenials into neighborhoods with a view to pushing up property prices for profit. 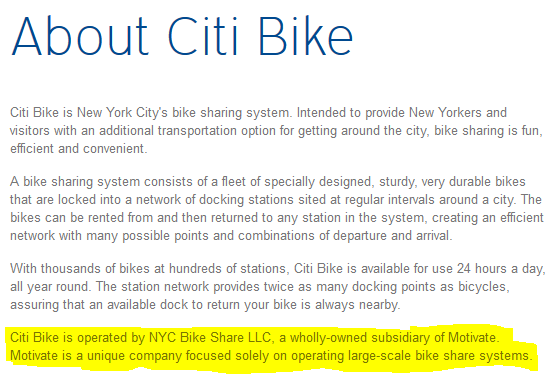 On the flip side, Related’s ownership of Motivate has led to a marked improvement in service and expansion for Citi Bike, which benefits the entire community (directly for members and indirectly through reduced public transport congestion, improved infrastructure for cyclists etc…). Furthermore, as Citi Bike extends its reach further out of Manhattan and becomes more reliable overall, there is a chance that more low income people become bike share members. My real takeaway here is the ability to capture positive externalities created by a public good through its ownership by a private entity with a complementary core business model. The High Line is another example of a private park that adds incredible value to the city, with 98% of its operating budget covered by donations to Friends of the High Line, mainly from local real estate developers – including Related Companies – who benefit from rising property values. This is a model that should be expanded in the Real Estate development space – with parks, gyms, infrastructure and public transport options controlled and operated by private firms who benefit from rising properties values, regulated by the State to ensure the public good remains available to the entire public. I wish Related would be more upfront with the fact they control all of the major bike sharing systems in the US. Doing so would undoubtedly cause an outrage from residents who feel threatened by the idea of such a large private company controlling a key part of their city’s infrastructure, but increased transparency would signal that Related are acting as a well-intentioned community member that is working to benefit all stakeholders, rather than devising a nefarious plan to add another zero to Stephen Ross’ net worth. Nice work. I stumbled upon Milwaukee’s apparent version of this today for the first time, so I thought of this and decided to give it a read. Thank you for sharing your thoughts on this very interesting topic. I also am a huge fan of Citibike and always like to find more about the system and people behind it. Great read.